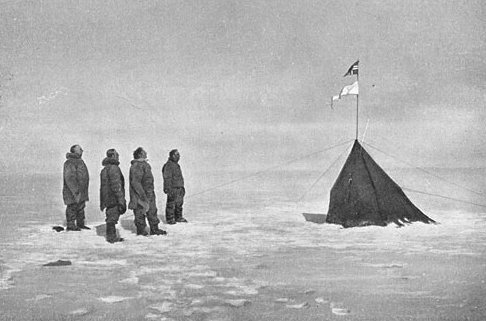 On this day in 1911, December 14, Norwegian Roald Amundsen became the first man to reach the South Pole. I feel a bit the way I do about people climbing Everest before it became a tourist trap, or some forbidding lonely mountain today. Way to go, dude. Amazing accomplishment. Now ruuuuuun. I mean, there are places you go because you want to be there. Some are easy to reach, others mind-bogglingly hard. But once you get there you kick back, satisfied not only with what you have achieved but where you are. Mountaintops aren’t like that. Mountains are amazing, magnificent, forbidding, dangerous, scary things. I have always remembered a warning line from the pioneering back-to-the-land-adventurously classic Mountaineering: Freedom of the Hills that “mountains are always more topologically complex than they appear from a distance”. Which means getting up them is way harder than it looks and getting around them is no picnic either. And that’s just peanuts to Antarctica. Its name is Latin for big white place where you die. No, actually, it’s not. And yes, I stole that line from Leslie Nielsen’s hilarious documentary on the ocean. Antarctica is of course boring Latin for “place that isn’t the Arctic”. But might as well be in terms of its equal or even worse inherent hostility to human life. Getting to the South Pole is an amazing achievement even if he cheated by doing it in summer. Just ask Robert Falcon Scott, whose team lost the race to the pole by just over a month and their lives. It is amazing. It is worth doing if only because it is there. But you shouldn’t be for long. Myself, I’m hoping to achieve some sort of fame by getting to the East Pole someday. Or perhaps the West Pole. Obviously it’s a lot less dangerous. But I figure it’s somewhere warm in the gorgeous tropical Pacific. So while you might not fancy my chances of making it, at least if I do, it will be worth hanging my hat on the thing and staying a while.